One of Luther’s great contributions to Christianity was that he pointed out that much of the common thinking about Christian living and attitudes comes from Plato and Aristotle, rather than from the Bible. Plato, for example, was a dualist – who viewed the physical world as inherently bad, and the unseen spiritual world as inherently good. Therefore, Plato taught that physical pleasure should be avoided; it was better to live a life of suffering and eschew pleasure in order to be more spiritual. This thinking worked its way into Christianity, to the point where things intended by God to be blessings for our enjoyment were rejected and forbidden. One such area was music. Luther is the one who introduced, or at least re-introduced congregational singing to the church. It may be hard to imagine, but until Luther brought singing to the church, there had been no such thing for at least several hundred years, if not more. Furthermore, the fact that there is congregational singing in Catholic churches today is directly because of Luther, and most hymns sung in the Roman Catholic Church today were written by Protestants. Our plan is to follow the example of the prophets and the ancient fathers of the church and to compose songs for the people in the vernacular, that is: spiritual songs so the Word of God may be among the people also in the form of music. Therefore we are searching everywhere for poets. Since you are endowed with a wealth of knowledge and elegance in the German language, and since you have polished it through much use, I ask you to work with us in this project. I would like you to avoid any new words or the language used at court. In order to be understood by the people, only the simplest and most common words should be used for singing; at the same time, however, they should be pure and apt; and further, the sense should be clear and as close as possible to the [Bible]. You need a free hand here; maintain the sense, but don’t cling to the words; [rather] translate them with other appropriate words. 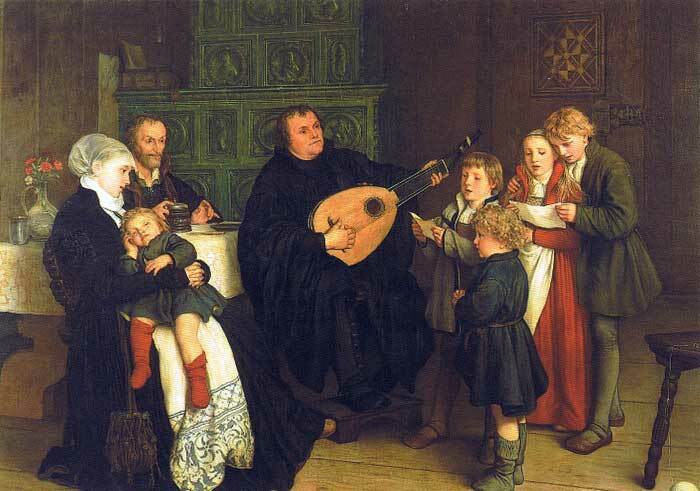 Furthermore, unlike Zwingli in Zürich, who forbade the use of musical instruments, Luther encouraged the use of musical instruments in church. Martin Luther not only introduced music back into the church, but he defined the parameters of what makes for good Christian church music. What that means is that all people are grappling with ideas and questions about God. Christians can be quick to discount what people “outside the fold” think or say about God – but the truth is that sometimes they have some pretty astute and profound things to say, even though they may have no commitment to Jesus. On the other hand, I am sometimes frustrated with the trite nature and shallow lyrics of some “Christian” music. The are some “secular” songs out there which put some “Christian songs” to shame, because they reflect a deeper, more sincere, more REAL engagement with questions about the person and character of God. Here are a few examples for you. If you have any others to suggest, leave me a comment below! Second: Dashboard Confessional. Listen especially to the middle of this one, where Chris Carrabba is asking God to help him with the sin he wants to be set free from and talks about his struggles with unbelief.